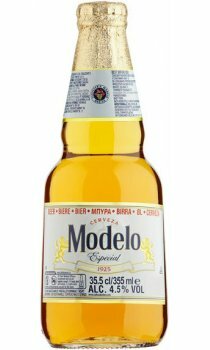 Modelo Especial is known to many for its full-flavoured taste, light hop character and crisp finish. A full flavoured Mexican pilsner-lager sealed with gold.” A pilsner-style lager brewed with premium barley malt, Modelo Especial is characterised by its deep golden hue, orange blossom aroma and slight hint of sweetness. Originally brewed as a model of what a good beer should be, Modelo Especial is known to many for its full-flavoured taste, light hop character and crisp finish. Still brewed in Mexico, Modelo Especial continues to honour its original vision by delivering a high quality, honest beer. To show off its character, we gave Modelo Especial a clear bottle with a unique shape and then sealed it with gold.